Once per turn, Xu Ji can choose two players with a hand. Both of these players must choose a hand card and display then at the same time. If both are red, both players recover one blood. If they are different colors, then the player who used a red card loses one blood. If they are both black, both players lose one blood. Both cards are discarded afterwards. When Xu Ji is damaged, she may exchange her hand with the player that damaged her. Xu Ji may choose herself when doing "Resolution". 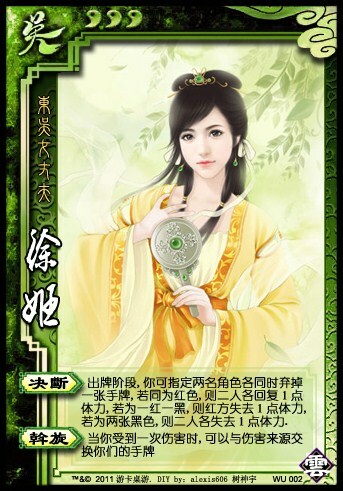 Even if Xu Ji, does not have any cards, she can exchange her hand with another player when she is damaged.